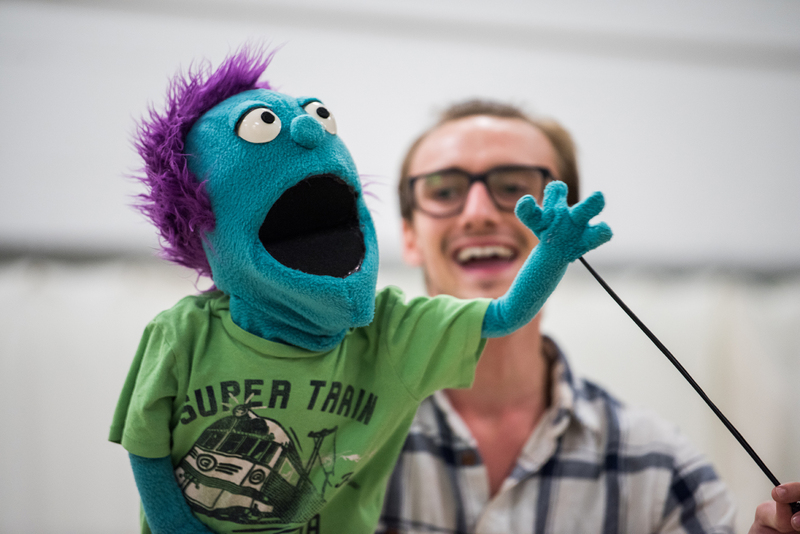 The characters in the SUNY New Paltz production of “Avenue Q,” opening April 19 at McKenna Theatre, have a lot in common with those in other plays: they are complex, expressive, charismatic figures, who confront real-world problems with a compelling mix of humor and vulnerability. Unlike most other characters who take the stage at New Paltz, however, many of the stars of “Avenue Q” are puppets, hand-crafted by costume design students who worked in consultation with alumna Danielle Jordan ’12 (Theatre Arts). The Department of Theatre Arts has offered special programming related to puppetry for a few years, and expanded these efforts in fall 2017 by bringing in Anika Larsen, a Tony Award-nominated Broadway actress with extensive experience performing with puppets, to lead a new course. The Department then needed to obtain professional-quality puppets for use in class and on the stage. Larsen helped guide that process, sharing her expertise about the impact of factors like construction, material and shape on the experiences of performers and audiences. The Department’s research led them to Danielle Jordan, who’d gone on to a position as the Crafts Artisan at the First Stage Children’s Theatre in Milwaukee, Wis., following her graduation from New Paltz. Jordan threw herself into the project, studying with colleagues, taking courses, and consulting frequently with the Department of Theatre Arts about “Avenue Q” and about the broader puppetry curriculum. “From a construction perspective, puppet-building combines traditional elements of both costume and prop making: cutting wood, foam and fabric, patterning, gluing, sewing, and so many other processes,” she said. When Jordan’s puppets arrived at New Paltz, Larsen was immediately impressed with their quality. 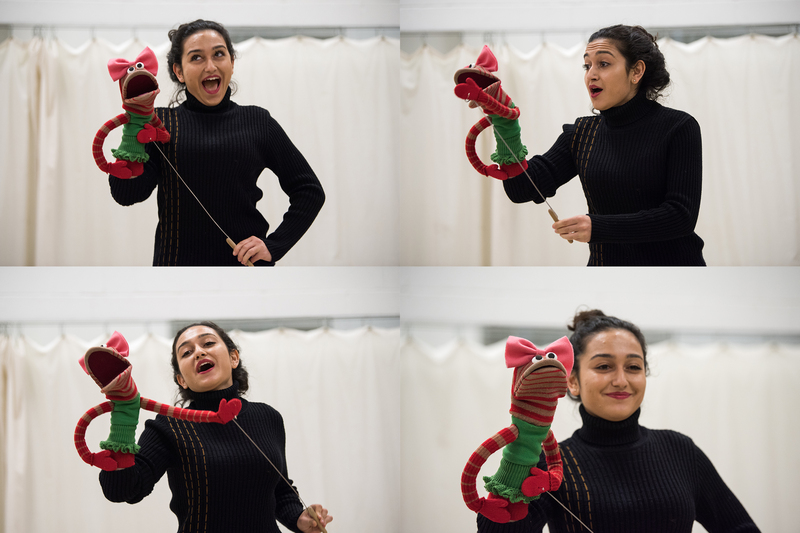 The 12 puppets Jordan created for the Department of Theatre Arts fueled a successful first offering of the “Acting with Puppets” course – so successful that the Department added another section to the spring 2018 schedule – and gave students a rare opportunity to learn the basics of an ancient, but still relevant, mode of performance. Larsen, who performed in “Avenue Q” on and off-Broadway as well as on the show’s national tour, is helping to advise the cast, crew and Director Bria Walker. Jordan, too, has continued to consult with the student and faculty costume designers who are creating the puppets for the “Avenue Q” performance. She even returned to New Paltz for a two-day “crash course” on puppet craft early in the spring semester. “Avenue Q” opened April 19 at McKenna Theatre on the New Paltz campus, with performances from April 19-22 and April 26-29. Visit the Department of Theatre Arts for more information, and be sure to check out Danielle Jordan’s website for news of her latest projects.